Meraki offer a free Access Point, but what’s the catch? If you’re in the IT profession, you’ll have heard of Cisco. Well, back in late 2012, Cisco announced that they had aquired a company called Meraki, which offer cloud managed networking devices, such as routers, wireless access points, and other networking hardware. If you watch one of their webinars, they’ll ship you a Cisco Meraki Access Point, totally free of charge. You don’t even need to cover shipping costs! To get one shipped for you, simply look out for an email after watching the webinar – you’ll be asked to get in touch with someone. Now, there are a few conditions, but simply put, anyone working in the IT industry can get their hands on one. These are ‘cloud-based’ devices, which believe it or not become useless without the cloud licence (which costs $150/year). The free device comes complete with a complimentary 3-year licence, which is long enough to give you time to test the device and integrate it into your network. gives you enough time to get the device integrated into your network, then they hit you with the annual licence renewal fee; by which time you’ll have no alternative. Also, if a company can just routinely send out free networking equipment, how much do these cost to produce? I’d expect there’s a big markup on these to offset the cost. Ubiquiti is my personal choice when it comes to wireless networking, since their devices are of great value, whilst still being a high quality product. Support offers a bit to be desired from what I’ve heard, though for the price of their equipment, you really can’t complain..
A few weeks ago, a company sub-contracted by BT Openreach installed the first FTTC (Fibre-To-The-Cabinet) cabinet just outside in front of the Welton Exchange. Here’s a pic. At last! Hooray! Brilliant! Fast internet! Well actually, no, not necessarily. 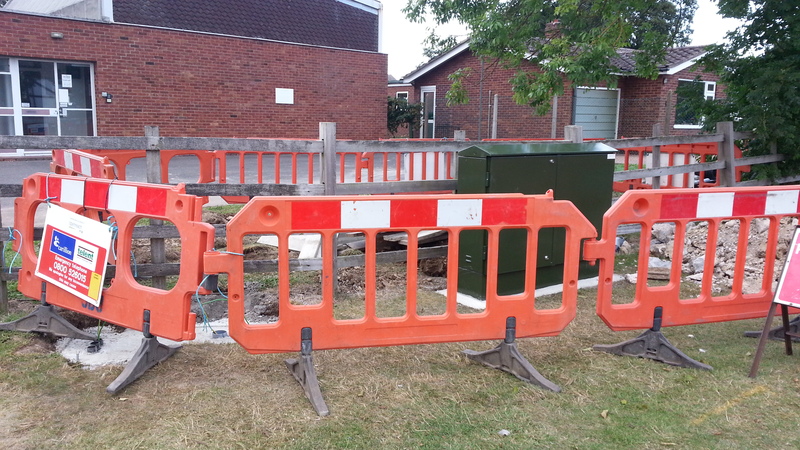 After a lengthy discussion with a senior BT engineer earlier this year, it seems that we’re ‘too close’ to the Welton Exchange, meaning we personally won’t notice an improvement in broadband speed. Afterall, the ‘fibre’ broadband we’re all sold in those adverts from BT, Sky etc. usually still has to make the ‘last mile’ (from the cabinet adjacent to the road to your home) via old-fashioned copper telephone wiring. FTTH (Fibre-To-The-Home) or FTTP (Fibre-To-The-Premises) is the only true fibre. And it comes at a price.